Well, the first casualty of this very wet and very windy summer. The Tomatoes. I had decided to plant these outside for the first time, they are usually in the poly. In the poly they just take over, and because of the lack of access to both sides they grow more than they produce. I decided to slow their growing, improve their pruning chance and see if I could get a good crop outside. I hoped, with 26 plants to get enough for salads, and then a whole crop for making pasata to cover the winters cooking – but alas Mother Nature had other plans. The last report had the tomatoes looking like this – down but not out. I thought they could be saved, propped up and live at least as long to get the fruit to ripen. Sadly I was wrong. More wind, more rain led to their demise. The wind had knocked them over, killed a good portion of the plants. The rain had then bought blight, yippee!. In a year when we have for the first time here got a potato harvest without blight we have raging tomato blight. Strange, and to think I planted the sweetcorn between the tomatoes and potatoes to stop the potatoes infecting the tomatoes!! As you can see they are blighted as well, and if not turned into something useful will have to go as well. So this year we will have to buy tomato sauce for cooking…………grrrrrrr. 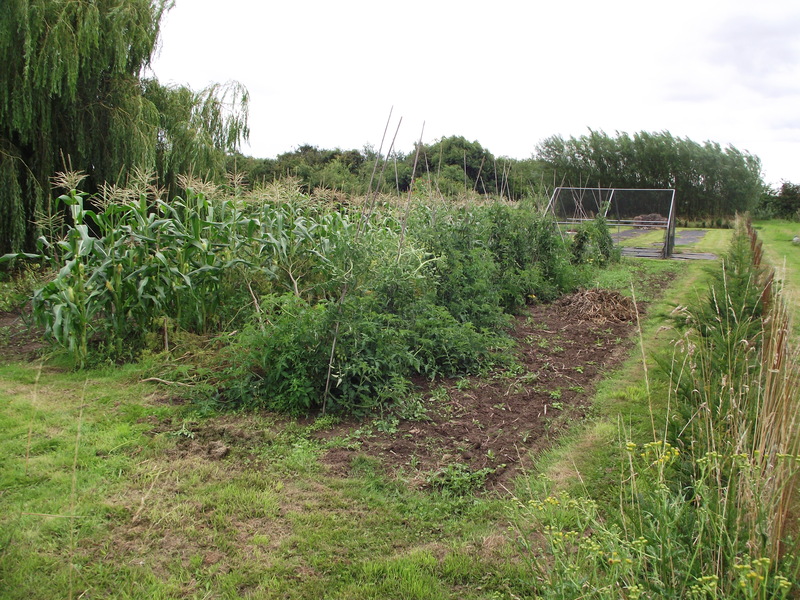 As you can see the sweetcorn are doing brilliantly……………………..not sure its an alternative to tomatoes but we and the chickens will have enough to last the winter!! We’ve also had a wet spring, but luckily our tomatoes are just now producing well. Usually that’s August here in New England for that. Our growing season is short! Our growing season seems to be splitting into two – a hot dry spring, a wet summer then a hot dry autumn. Nevertheless, my wife is never going to forgive me for losing the tomatoes this year! !